Overall Condition Good to fair. Some of our beads have traveled at least three continents, and have graced numerous owners. Small chips, corrosion, and pitting are a normal part of their patina attesting to their age and extensive use. Bead Size 6-7 mm diameter. See picture with penny for size comparison. Additional information: Venetian Chevron beads are the most beautiful, recognizable and collectable of all of the Venetian "Trade Beads." Chevrons beads are made by a multi-part process. They start with the making of the cane, then another color glass is added and then this is usually put into a 12 point star mold. This process is repeated for each additional layer on the bead. Chevron beads, also called "Rosetta"and "Star" beads have been made Venice since the late 1400's and are still in limited production today. The earliest chevrons were typically 7 layers of color and this production ran from the late 1400's through to the 1500's. There are also 8,9, and 10 layer beads from this period. The next production phase was in the 1600s-1700s and the layer count went down to 3 and 5 layer beads and the majority of these were heat rounded via the "a speo" method. The Venetian Chevron production with the highest volume of beads was in the late 1800's and early 1900's. These beads were usually 4 and 6 layer beads. 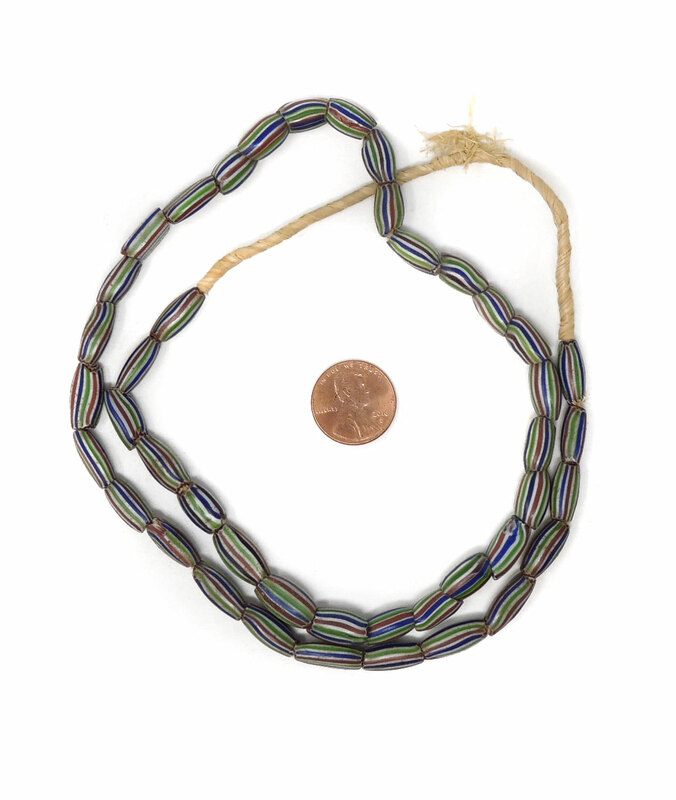 Chevron beads have been traded throughout the world, but most heavily in Africa. 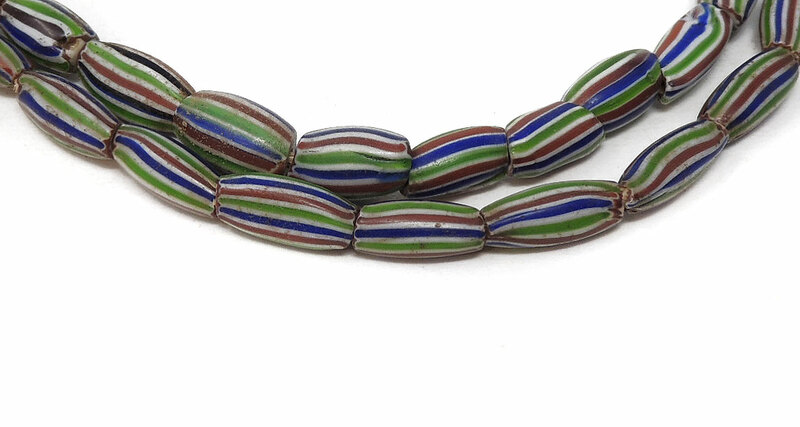 The Dutch traders were the first to bring Chevron beads to Africa in the late 1400's. There are certain tiny 7 layer Chevrons from this same period which are only found in Peru and are attributed to being distributed by Christopher Columbus. Chevron beads are still being made in Venice today but in a limited quantity. They are also being made now in India and China but with a slighly different process. There are also Chevron bead makers in the world today designing and creating some beautiful beads. The two most famous Chevron bead makers today are Art Seymour, of the United States, and Luigi Cattelan, of Italy. We get many questions about counting the layers in Chevrons. In the bead collecting world, the layers in Chevrons are counted from the inner most layer (around the perforation) out to the outermost layer. Layers are typically counted by the different colors. This can be tricky with the older 7 layer beads because the innermost layer is usually a transparent green. You can see some great examples of how these beads were worn by their owners in Africa in Africa Adorned (Fisher) and The Bead is Constant (Wilson). You can see excellent examples of chevrons in The History of Beads (Dubin), Collectable Beads (Liu), and A World of Necklaces(Leurquin). However, the most informative and illustrative work on the Chevron bead is by John and Ruth Picard - Volume VII - Chevron and Nueva Cadiz Beads.